Heavy Duty Specialists is a proud supplier of the Turbo-2000. Click on the tabs below to learn more about this state-of-the-art desiccant air dryer. For more information, you can also download the entire service manual for the Turbo-2000. The Turbo-2000 is the recommended choice for severe stop-and-go operations, where the compressor output reaches 30 CFM and duty cycles run as high as 40%! Its ratio of large purge volume to desiccant produces the ideal filtering system and contamination protection for heavy duty service operations. A four way filtration system, consisting of three filter screens, a unique filtering bag, plus four pounds of high quality molecular sieve desiccant, strips away moisture and traps compressor blow-by. The spin-off cartridge can be serviced in minutes. The compact purge tank can be installed anywhere and provides a full 460 cu. in. of clean purge air. The patented internal valve system provides full turbo boost protection and an internal feedback feature required for the Cummins/ Holset QE and E-Type SS compressors. No additional external valves are necessary, reducing the risk of freeze-ups. The system is fully compatible with all engine manufacturers. For all-weather operation the Turbo-2000 is equipped with a sealed 12 volt (or optional 24 volt) 75-watt thermostatically controlled heater. Compressed air is used in a variety of vehicle vocations (both traditional and non-traditional) primarily for brake application. Compressed air also operates for air seats, air ride suspensions, air shift, horns, etc. Mounted directly to the engine, the compressor is controlled through a pneumatic device known as a D2 governor. The governor controls the compressor's pumping and non-pumping cycles. Diesel engine designs, in order to achieve optimum horsepower and fuel efficiency, incorporate the use of turbo chargers. A turbo charger forces greater amounts of air into an engine's combustion chamber for a cleaner engine burn. On vocations where an air compressor's intake is connected to the pressure side of a turbocharger, the compressor produces a greater CFM (cubic feet per minute) flow rate. Flow rate, compressor duty cycle and vehicle vocation are three variables that affect an air compressor, air dryer, and the entire air system. Size of the compressor (cfm) is predicated by the air requirements of the vehicle vocation. Compressor CFM and duty cycle determines air dryer model type required. Some vocations may require the installation of dual air dryers to meet the demands of high air flow (CFM) and duty cycles. During the non-pumping cycle, turbo boost pressure is lost through the air compressor's exhaust valve(s) and exits through the air dryer's open purge port. To prevent this, SKF's turbo series of air dryers incorporate a turbo boost protection valve. Discharge Line Unload (DLU) air systems do not require turbo boost protection as the compressors are naturally aspirated and designed to pump continuously. The SKF HD air dryer is controlled by a traditional D2 governor allows the compressor to pump continuously through the purge port of the air dryer. This allows the air compressor to run cooler. The TURBO-2000 and HD-2000 incorporate four pounds of desiccant and a separate purge tank (460 cubic inches) that is isolated from the vehicle air system. The purge tank stores clean, dry air for regeneration of the desiccant bed. The design of these air dryers serve vehicle vocations with compressor duty cycles of up to 40%. Air dryers are constructed of a lightweight aluminum and steel housing with a unique spin-off cartridge. Below the cartridge are five ports: 1) inlet, 2) outlet, 3) regeneration, 4) control, and 5) purge port. Each port has a specific function. The inlet port receives contaminated air from the air compressor. Outlet port directs clean dry air to the air system. Connected to the isolated purge tank is the regeneration port. The control receives an air signal from a governor device and the purge port expels water and contaminates from the air dryer. Hot, compressed air enters the air dryer through the inlet port. As the air enters the dryer, the air expands; oil and water vapor condense, and accumulate in the sump. The air passes through a series of filters and a cloth bag removing carbon and other contaminates. Removal of the remaining water vapor occurs as air passes through the desiccant bed within the cartridge. The clean dry air is then directed to the vehicle air system through the outlet port. The 2000 series of dryers simultaneously refills a regeneration tank through the regeneration port. When the air system reaches the governor-regulated cutout pressure (typically 120 psi), the air dryer purge valve opens via an air signal received from the air system governor. The governor will also simultaneously signal the compressor to stop compressing air in vehicle applications not utilizing a DLU (Discharge Line Unloaded). 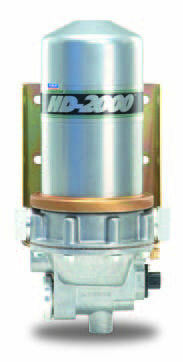 In vehicles utilizing a DLU, a naturally aspirated air compressor or non-computerized engines, the HD-2000 air dryer is required, as the compressors will continue to pump air through the air dryers purge port. The air dryer's check valve closes during the non-pumping cycle of the compressor. 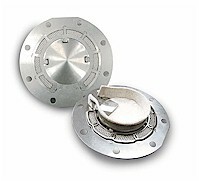 With the check valve closed, air system reservoirs maintain air pressure. The filtered, dried purge air, which has accumulated in either the external isolated purge tank begins a controlled regeneration cycle flowing clean dry air through the air dryer desiccant bed. This regeneration cycle, removes accumulated moisture from the desiccant bed; back flushes and cleans the filters expelling contaminants out the dryer's purge port. This completes the regeneration cycle. When the air system pressure drops to the governor regulated cut-in pressure (typically 95 psi), the air dryer's purge valve closes as the valve reacts to the evacuating of air pressure through the exhaust (EXH) port of the governor. The compressor then begins the pumping cycle. 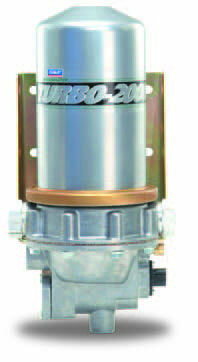 Additionally, the TURBO-2000 design includes an additional valve within the dryer: (Turbo cut off valve). This valve ensures engine boost pressure will not escape out the air dryer's purge port during the non-pumping cycles. SKF offers additional air dryers to meet the unique requirements for the Holset SS or QE designed air compressors. These air compressors require a differential check valve which maintain's system air pressure within the air compressor's discharge line. The Turbo-2000 is the recommended choice for severe service applications, where the compressor output reaches 30 CFM and duty cycles run as high as 40%! Its ratio of large purge volume to desiccant produces the ideal filtering system and contamination protection for heavy duty service today. A four-way filtration system, consisting of three filter screens, a unique filtering bag, plus four pounds of high quality molecular sieve desiccant, strips away moisture and traps compressor blow-by. The spin-off cartridge can be serviced in minutes. The compact purge tank can be installed anywhere and provides a full 460 cu. in. of clean purge mr. 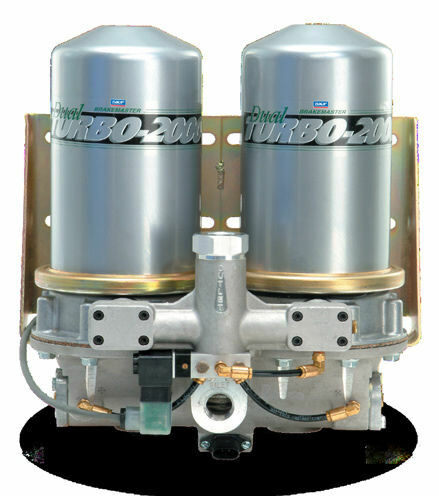 The Turbo-2000 models are available in standard and Holset QE compressor compatible versions. The Holset QE compatible models include an internal valve system that provides full turbo boost protection and an internal feedback feature required for the Cummins/Holset QE and E- Type compressors. No additional external valves are necessary, reducing risk of freeze-ups. The standard model Turbo-2000 provides turbo boost protection and is compatible with all non Holset QE, HD and E- Type compressors. For all-weather operation the Turbo-2000 is equipped with a sealed 12 volt (or optional 24 volt) 75 watt thermostatically controlled heater. The CR Brakemaster HD-2000 is designed to provide optimum protection for naturally aspirated compressors and systems employing continuous pumping compressors (Discharge Line Unload). The HD-2000 is the recommended choice for severe service applications, where the compressor output reaches 30 CFM and duty cycles run as high as 40%! Its ratio of large purge volume to desiccant produces the ideal filtering system and contamination protection for heavy duty service today. Extended compressor life may be the primary benefit of the HD-2000. At maximum performance it has an internal pressure drop of only 3 psi! As a result, the compressor runs smoothly under a continuous load. For all-weather operation the HD-2000 is equipped with a sealed 12 volt (or optional 24 volt) 75 watt thermostatically controlled heater. The CR Brakemaster Dual Turbo-2000 is designed for vehicles that use large amounts of air, such as transit and refuse, which can require nearly 100% compressor charge time at 40 SCFM. This ingenious, drop-in replacement dryer consists of two desiccant cartridges and one base with electronic toggle device to channel air flow through one cartridge while the other regenerates. Like all CR Brakemaster dryers, it is equipped with a 12 or 24 volt heater. However, unlike other models, the Dual Turbo-2000 does not require a purge tank: instead, purge air is provided by the opposing cartridge. Large inlet and outlet ports minimize a pressure drop within the dryers, easing the burden on the compressor and extending its service life. The internal regeneration process provides highly efficient drying and contamination removal to optimize air purity and availability. Proven effective by the country's largest and most severe-use municipal fleets. Keeps air system clean, keeps air capacity high-even in the most severe use situations requiring 100% compressor duty cycles. Electronic toggle device channels air flow through one cartridge while the other regenerates. Internal Oil Separator removes compressor blow-by before entering desiccant cartridge - protects downstream components. Easy to install and service; reduces fleet downtime. The new Turbo-2000 Integrated Oil Separator is an internal accessory for SKF's Brakemaster series of air dryers removing oil contaminants introduced into the air system via the vehicle's air compressor. Oil infiltrating the desiccant and shortening the cartridge service life. Damaged dryer and downstream valving. Coked up discharge link causing reduced air flow. Reduced air capacity as tanks fill with oil. Positioning of the separator inside the dryer before the desiccant bed.